Don’t spend your Shanghai stopover inside the airport; maximize your time in China and opt for a private and customizable sightseeing tour instead. This personalized layover tour is tailored to your needs and allows you to tick off The Bund (Waitan), French Concession, and Yuyuan Garden in limited time. Airport or hotel pickup and drop-off are included for added convenience. The tour starts 1 hour after flight landing. Please contact your local operator if you have to take a long time in custom, and your driver will wait for you in the arrival hall. Snow was an excellent tour guide. She is very personable and full of information. We were able to go to multiple destinations including the gardens, new Shanghai and old Shanghai. Lunch was included with the tour and we were able to squeeze in a few shopping trips. I highly recommend this tour. The Shanghai layover tour with Wilson of Amazing Shanghai Trips gets 5 stars! It has been such an enjoyable experience having a layover tour with Amazing Shanghai Trip. And my guide Wilson has been excellent. The pickup from the airport was seamless. I got clear instructions on where to meet my driver and I did not have to wait for him. Once we got into the city, I met my guide, Wilson who was brilliant. Wilson has very good English and his knowledge and history of the city and area was very informative. Wilson structured the tour to do what I wanted and it was at the perfect pace. Dealing with the company has been above par and I would recommend both this company and Wilson for anybody who wishes to have layover trip while in Shanghai. Wilson was great! Very attentive to our needs (we wanted local street food) and created a custom experience that was perfect for us! He was very knowledgeable about Shanghai facts and Buddhist traditions that were fascinating to us. Thanks Wilson, best layover ever!! I give a 5 star review for this tour. The driver was very prompt in picking us up from the airport as soon as we landed. And the pre-tour instructions were detailed and helpful in getting out of the airport. The tour guide was very personable, pleasant, enjoyable, and flexible with our group's desires. We saw everything we wanted to see and had a great daylong tour in Shanghai. 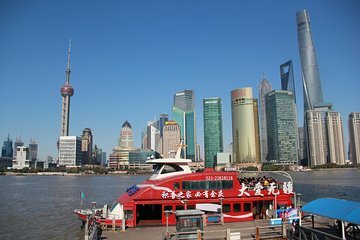 Everything was seamless, effortless, and I highly recommend this tour whether it's your first time in Shanghai or even if you're a repeat visitor! It was excellent with our tour guide Snow! She was extremely knowledgeable of the city and very warm and welcoming in answering our questions throughout the tour. I am very pleased with the service we received and my friends will all be jealous of the amazing pictures we took. Unfortunately, my layover was up and I must fly to LA. I plan on returning soon for another tour that is longer! Snow did a wonderful job of providing us with a complete and concise introduction to Shanghai. The pacing of the tour was perfect with a great mix of contemporary and old Shanghai. Additionally, we were able to get a tasty sampling of local cuisine for breakfast, lunch. Snow was very knowledgeable about the city, history and local sights...and was very friendly and fun for our entire group. Highly recommended! Five stars! Everything is excellent. Our tour guide Snow, she is very patient and helpful. The driver is very quick every time to pick us. We visit the Bund, Yu Garden, Jade Buddha Temple and Xintiandi. The restaurant we eat lunch in the Shanghai Tower paradise dynasty is very good. We are very satisfied with this tour and we will highly recommend this tour. Seven of us had a fantastic tour with Snow. When we first booked the trip, Alana provided us with very helpful details to get through customs and the airport. We visited several locations including the Yu Garden, Economic Center, French Concessions, Bund and temple. Snow was very knowledgeable and was able to answer our questions. All in all we had a wonderful tour. I would highly recommend taking this tour if you have a layover in Shanghai. I highly recommend this tour! The communication was great, I knew exactly where I was being picked up at the airport and they helped me with getting a visa. We visited so many places on the tour including new Shanghai, Bund, Yu Garden, and lots of shopping! We had local dumplings for lunch and they were incredible! Snow was a great guide and gave me lots of information on the city's history! If you have a long layover you should use this tour to get out of the airport and see the city! I’m here for a layover in Shanghai and because I'm only here for a short time, I wanted to make the best of it. I wanted to experience as much as I can in such a short time and I'm so glad I booked this tour! I got to visit so many places and try so much of the local food. It started when I got off my plane and when I left the arrival hall, there was a driver waiting for me with my name on a paper. Afterwards, he escorted me to a van where we drove to the city to meet up with Berlin, my tour guide. She's the best. The tour was customized to my interests and on my time schedule. She showed me amazing places, food, and even this amazing Starbucks. I'm not much of a Starbucks person but this will definitely be the coolest one you ever visit. It even has a factory inside where you can watch and the food is so fancy there. I totally recommend this tour. I wouldn't have been able to experience this much of Shanghai in such a short time on my own.